“Sally sells seashells by the seashore. Although I cannot say the above tongue twister three-times fast, I can decorate with Sally’s proverbial seashells! The temperatures in NYC have been rising, the mercury has reached a lovely 79 degrees fahrenheit, and I found my thoughts drifting to the tidal patterns of the shoreline. Oh to be on a beach! Excerpt from Liz Lange”s Westchester, New York home as designed by the inimiatable Jonathan Adler. 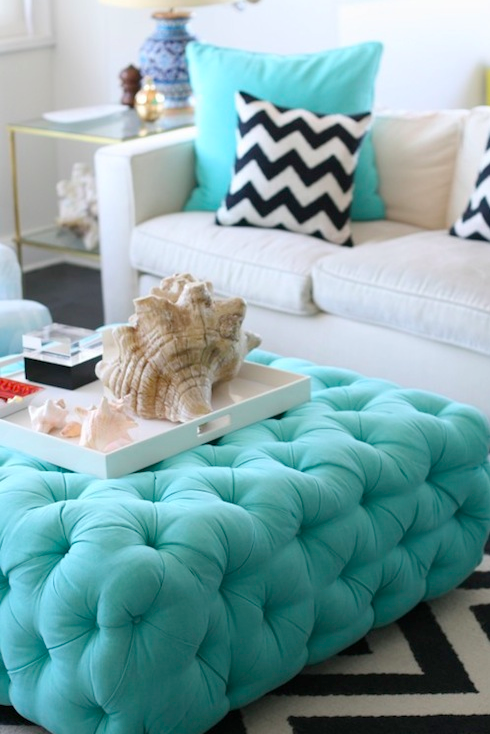 The large ottoman is upholstered in Hinson’s Montauk Texture in Aegean. The chevron rug brings a touch of mod, sixties contrast. Image via House Beautiful. This beach abode is elegant and pure. The airy, white chairs, mantle and blinds allow the light to flow freely. Many of the textile details have an almost chinoiserie vibe. 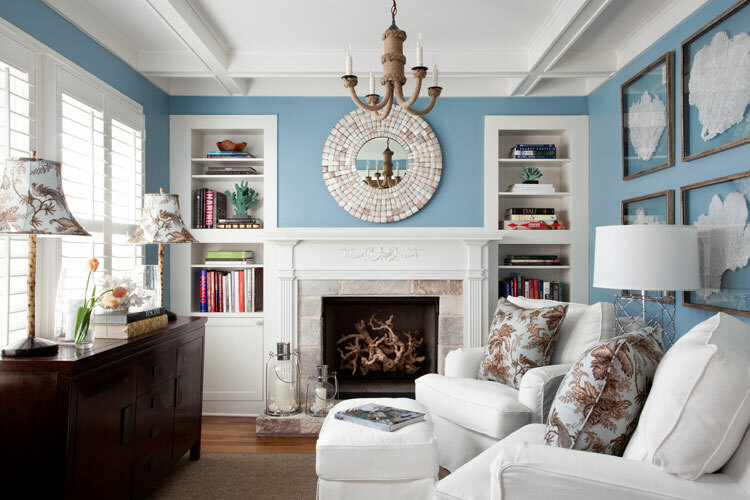 The framed coral samples on the wall, and drift wood in the fireplace keep this place from looking too polished and cliche. Image via Heather Scott Home & Design. Power couple Ali Wentworth and George Stephanopoulos share their eclectic pad with Elle Decor. Inspired by vintage issues of National Geographic and their world travels, Wentworth’s collection of lilac sea fans, coral, and shells lines the minimal, cream shelves. If you have ever met met, or gone antiquing with yours truly, you will know that my dream is to live in a room with hundreds of specimen containers, cloches and chemistry sets. All of this is tied together with lilac accents and a purple, moroccan pouf. Photography by Simon Upton. 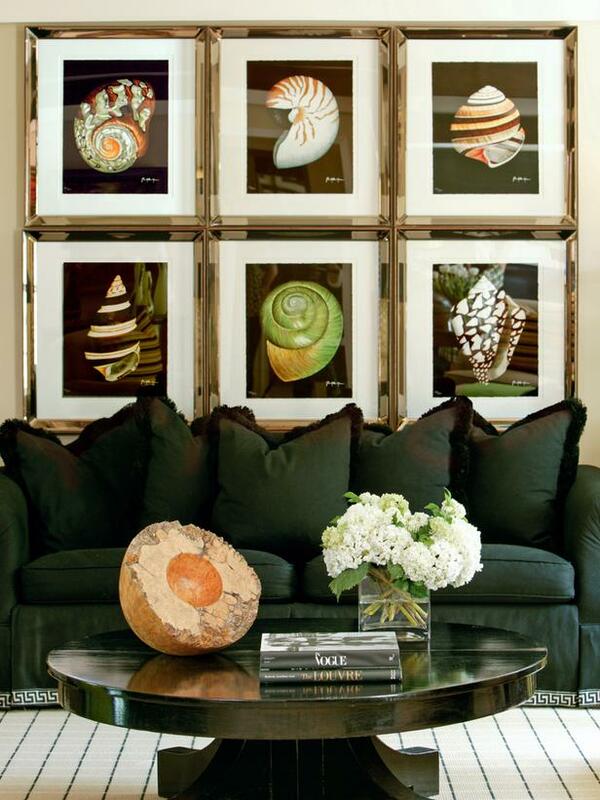 Create a large eye-catching, mural-style gallery display by grouping smaller prints together. Photography by Nancy Nolan for Tobi Fairley Interior Design.